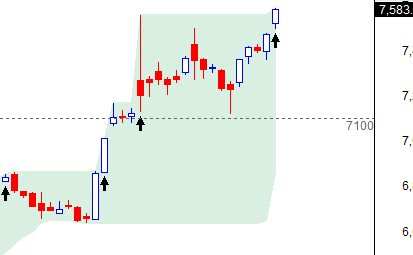 Possible breakout from flag pattern in nifty. Flag patterns are nothing but a pause in a trend.... here are some examples and you can then visualize what will happen next. Last series, option writing clues indicated strong resistance at 7500. Subsequently this level was taken out but not strongly. Option writing later on indicated support at 7500. Expiry was couple of points below 7500... this means option writers won whether they wrote 7500 call (at start of series) or 7500 put (after breakout above 7500). What does JULY series point to? On EOD charts, nifty continues to trade in a channel. Bank NIFTY is trading in the high low range formed on election results day. 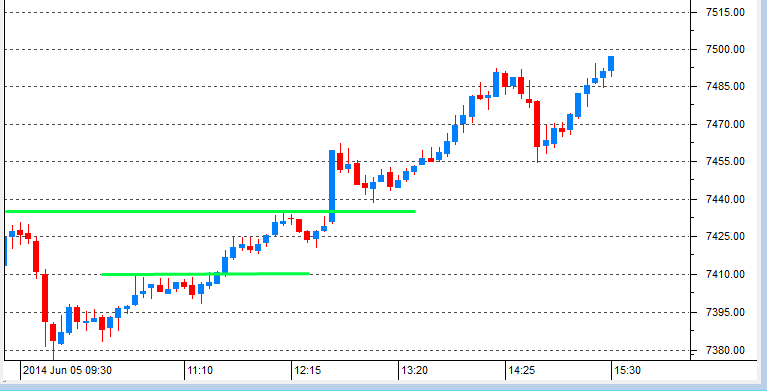 So it is trading within a range formed by bounding levels at 14500 and 16000. 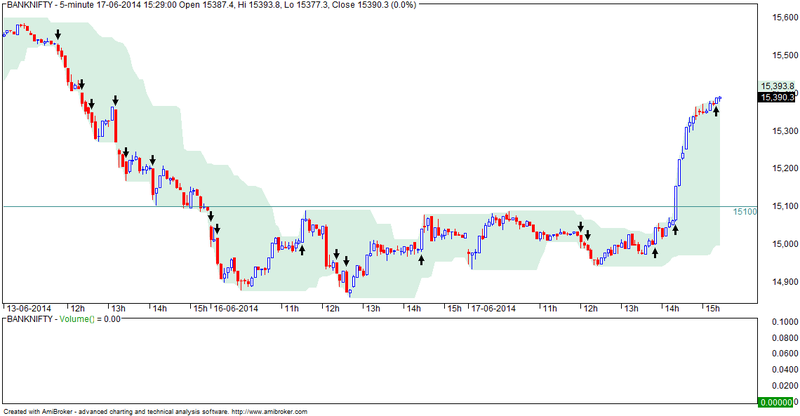 Size of range is 1500 points so whenever there is a breakout, expect a move of 1500 points. My bias is bullish so I am expecting an upward breakout. Already posted on 17th MAY that my long term target for BNIFTY is 20000. Broader trend is up... immediate market direction points to corrective/ sideways movement. Basically what we are seeing is a channeled move - when this move ends, the prior trend (in this case, up) will resume. In our case, I am looking for a close above 7600 spot as a sign of bullishness. Further, the close must be near the day's high and not the low. 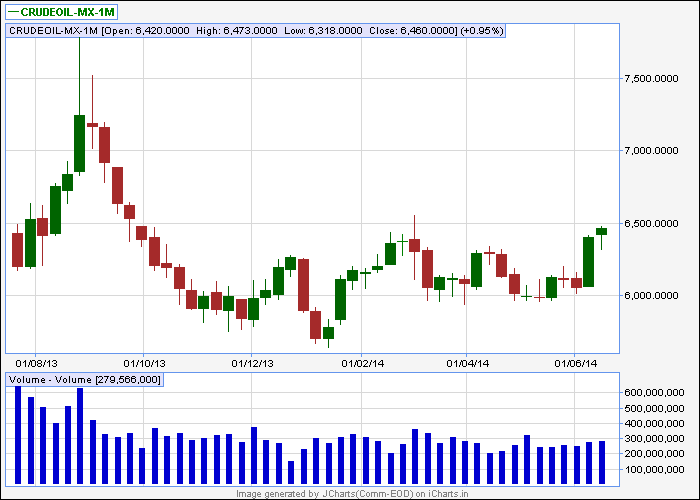 CRUDE is trending sideways .... broader trend is down with strong resistance at 6500. Corrective phase continues but broader trend is up. Option writing points to support at 7300 and resistance at 8000 (July). This means option writers are expecting a small correction followed by a big rally in JULY.... let's see. Yesterday's small hammer lead to some bullishness today. Most importantly, break of 7480 has not lead to any dramatic correction. 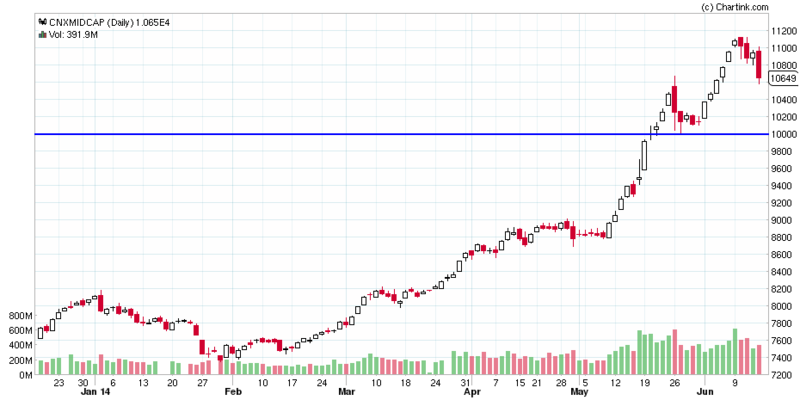 Now subject to markets holding above 7480 spot, chances are high that a new high close is possible. Sometimes you need an AFL which makes it easier to identify certain stocks. At times like this, color coding helps a stock visually stand out so it gets your attention. An example is this report which visually highlights stocks gaining or losing more than 2%, close above/ below 10 DMA and RSI more / less than 80/ 20. 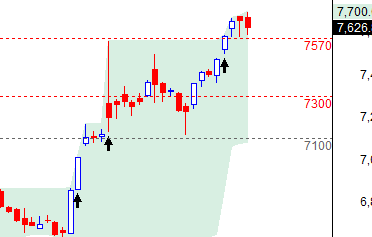 Trade long if nifty holds above 7560 spot. Resistance 7680. Markets break support but no signs of any strong selling. Closing was actually bullish! Broader consensus view is that the multi year bull run in GOLD is over and now a long bear phase has started. This is how the monthly charts look like. Note that I have not shown the rally starting 10000 levels. 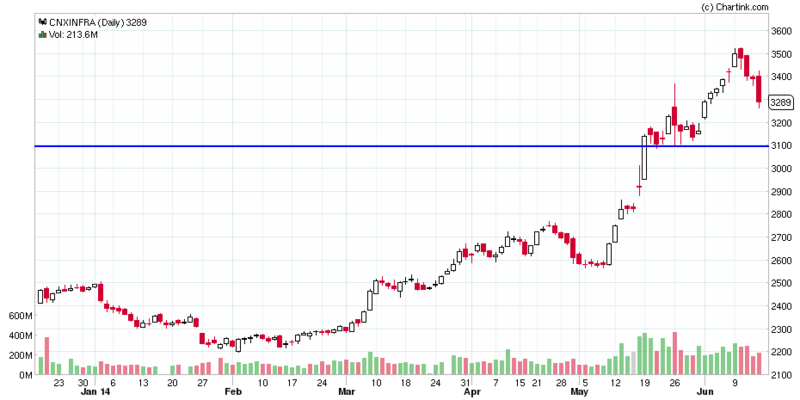 What is however clear is the strong support at 25000. 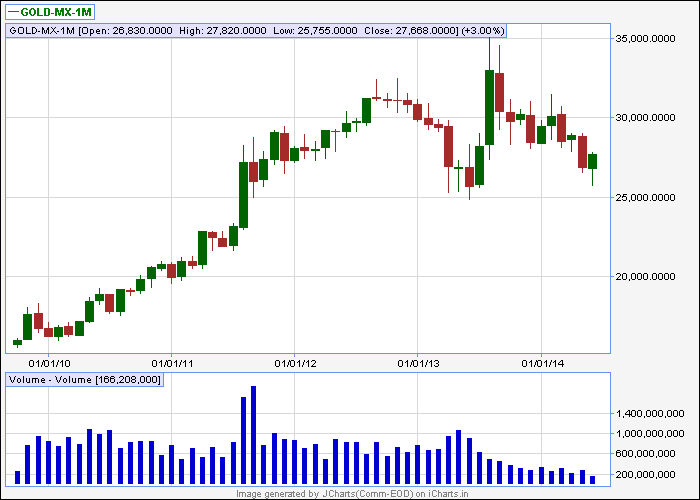 Now if you are a long term investor in GOLD , you should be worried only if this level breaks. This is likely to get limited around 28000 as this level is likely offer strong resistance. 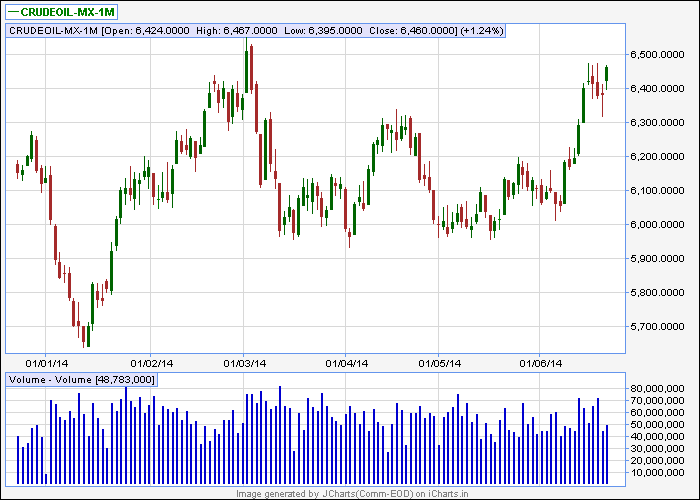 CRUDE is trading between 5950 and 6500 and is nearing upper end of the trading range. 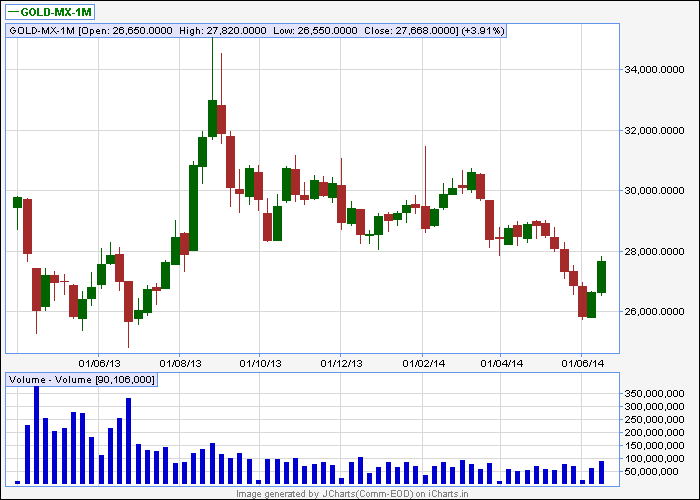 Weekly charts shows the resistance level very clearly. Sustaining above 6500 will be bullish. Weekend charts point to selling at higher levels. The bearish view says we have seen down days on last 2 Fridays. The bullish view calls for trend being up with SL at 7480 spot. Inability to stay above this level next week can lead to selling. Next support/ swing low at 7100. 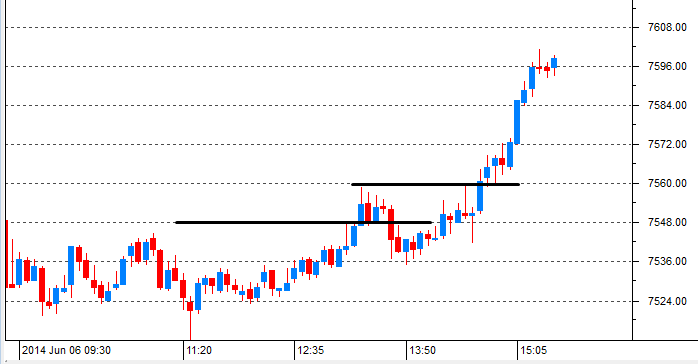 This is what the 5 min charts look like for the day... note charts are spot and not futures. It is obvious we have first resistance at 7560. 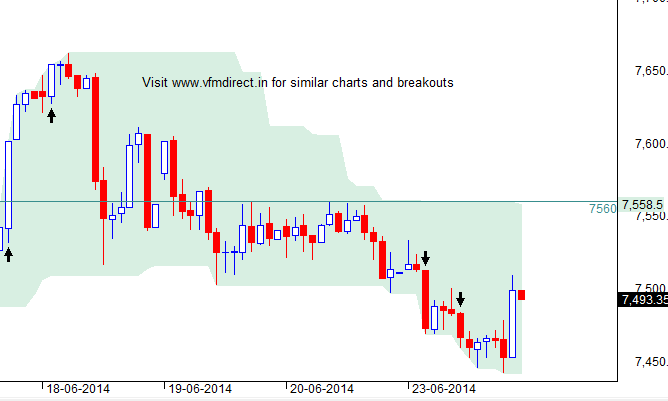 On EOD charts, consider trend up as long as nifty trades above 7480 spot. Note that while trendline was broken intraday, nothing happened and there was no further selling. Yesterday's pullback fizzles out and fails as markets fail to sustain at days highs and sell off. This sell off was most visible in midcaps where many stocks lost 5% in less than an hour today!. Now markets are back to trendline support ... since we have a minor swing low at 7480, a close below this will lead to correction. Better to stay out of market and do nothing rather than do something and wish you did nothing. Yesterday's breakout above 7550 fails as markets fail to sustain above 7620. Note that I am using spot nifty charts and not futures. 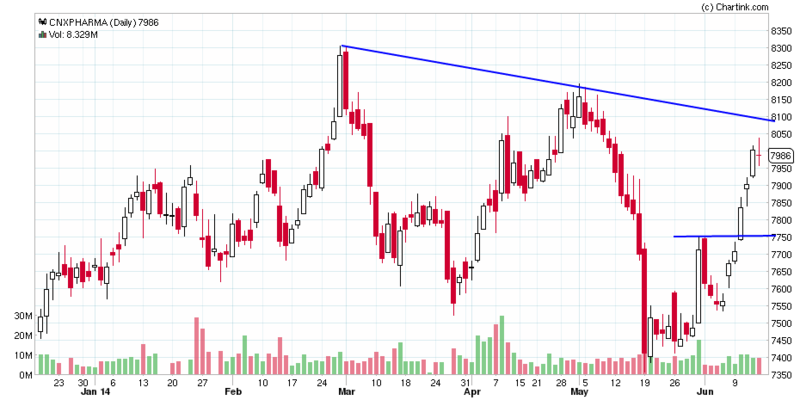 BANK NIFTY gives a breakout on intraday charts. NIFTY takes support at trendline and bounces up. So now we have two swing lows one at 7480 and 7100. We got stopped out in the minor trend / rally starting 7100. The broader trend starting 6600 is still up. Option writing points to support at 7500 and resistance at 8000. 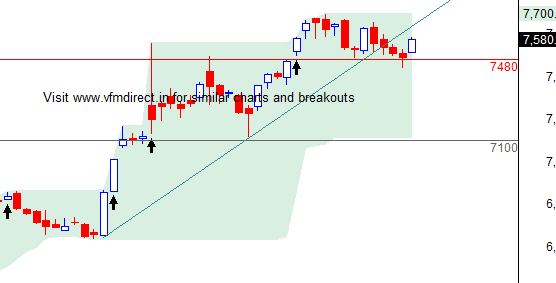 Immediate short term trend of nifty is down and is likely to worsen below 7450 spot or on break of green trendline. Broader trend of nifty is up with swing low/ support at 7100 - this level also coincides approx with the 61.7% of the rally starting 6600. 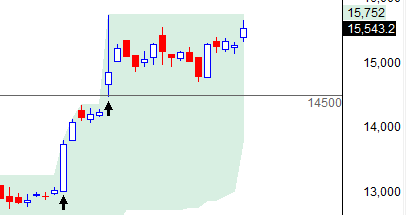 Option writing is not giving any clear levels for support and resistance. Trailing SL hit for infra stocks... trend reversal on close below 3100. Trailing SL hit for midcap index... trend reversal on close below 10000. Trend is up with reversal on close below 7750... expect resistance at 8100. 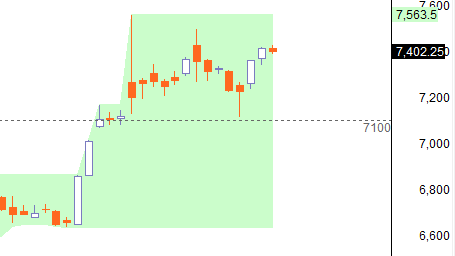 Close above 9600 OR holding 9300 will be bullish. 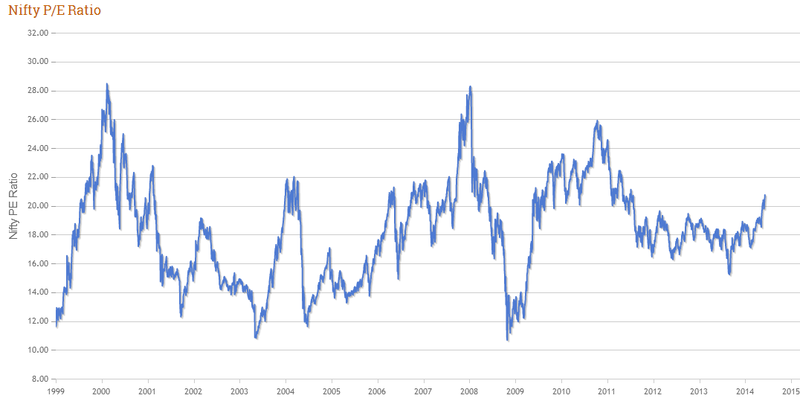 Note that this index has not participated in this recent rally. Markets selloff and nifty closes below 7570 spot... my first trailing SL level. So if you were long on nifty, you are out of trade now. 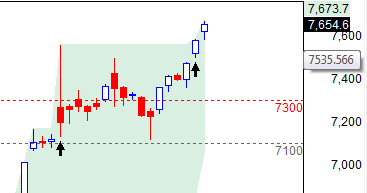 I am bullish on nifty if it manages a close above 7570 spot... close near day's high has even more bullish implications. 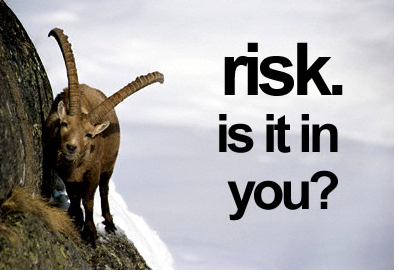 High risk traders can buy 8000 call as a lottery and hold till expiry. CMP Rs.6/-. No SL no target. Do not invest more than 1% of your capital in this trade. 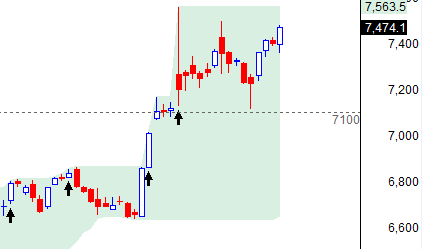 Close below 7570 spot can lead to profit booking and start of a correction. EDIT: as markets close below 7570 spot this call has failed. So 8000 call closed at 3.60 giving a 50% loss or a 0.5% loss on capital employed. While there was no SL, we are out of trade as markets closed below a certain level. Position sizing also helped minimise loss. 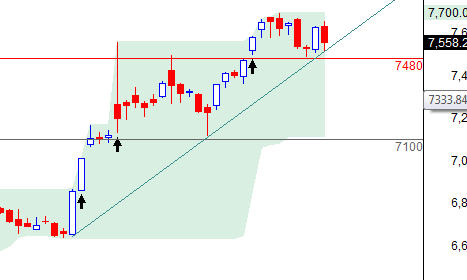 NIFTY trend is up with support at 7570. Strong close below 7570 will lead to a correction of this rally. Very often, when you write a code for trading signals, you get multiple signals. What you are interested is in the first signal and you would like to ignore the subsequent ones. This AFL will help you achieve this. Trend is up with support at 7570. 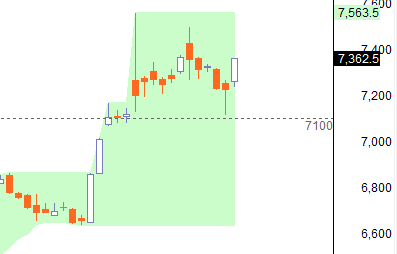 Below this, next supports are at 7300 and 7100 (swing low). Advance decline was negative though not strongly. Not surprisingly there are hardly any buy signals today. Nothing on sell side as yet as the trigger levels for a trend change are deep down. 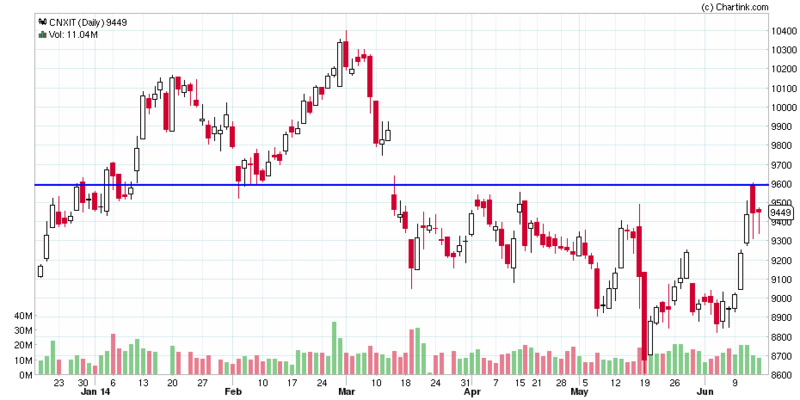 The IT index had corrected and broke its recent support at 9600.... now this level will offer resistance. This is also the breakout level so sustaining above this can lead to a rally in IT stocks. 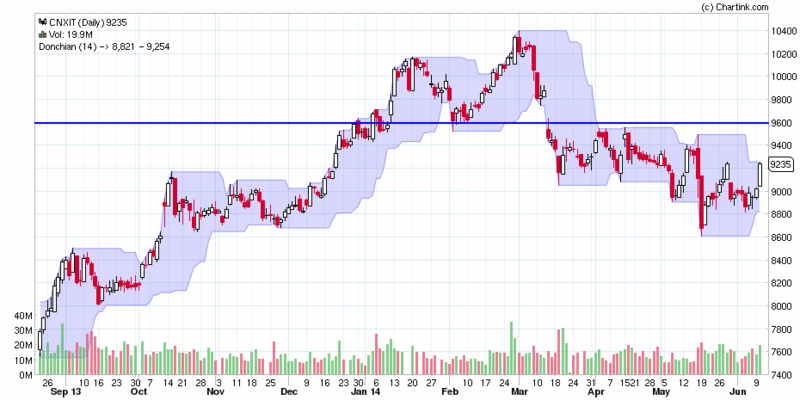 NITFY trend is up with support at 7570... tight SL. 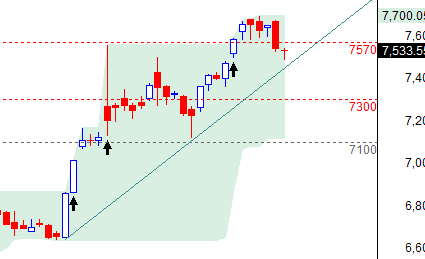 Below this, next supports are at 7300-7100. 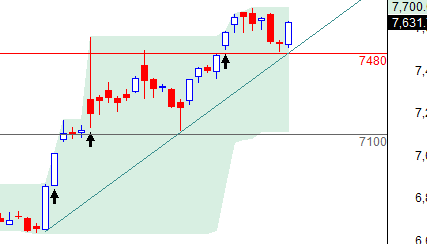 Nifty trend is up with support at 7300 and then 7100. Option writing is not giving much clues. Option writers are squaring off their positions at 7500 (I guess at a minor loss) but this strike price still has the highest open interest. Ideally there should be aggressive put writing but that is not happening. NIFTY P/E has historically ranged between 14 and 30. Traditionally it has always been of investing when the PE has dropped below 15 with exit above 22-25. Current NIFTY P/E is 20 which means some more upside is there in the markets before stocks begin to start looking expensive. Note that returns after an overbought market have generally been negative for next 2-3 years. NIFTY closes at lifetime high and above the 16 MAY election result day. Trend remains up with SL at 7100. Option writing points to support at 7000 and resistance at 7500. Note that highest OI is still at 7500 call inspite of a a reduction today. Most likely highest OI will move to 7600 call. Short and simple... trend is up with SL at 14500. Expect more gains above 15800. Easy trade: Initial breakout above 7540F was a failure and whipsaw. Second breakout was profitable. High risk/ contrarian traders: breakdown failure of days low (11.20, 7520F) would be a buying opportunity. By same logic, these people would have covered at 7550F, shorted the market and would have been stopped out. Consider trend up as long as nifty trades above 7100. 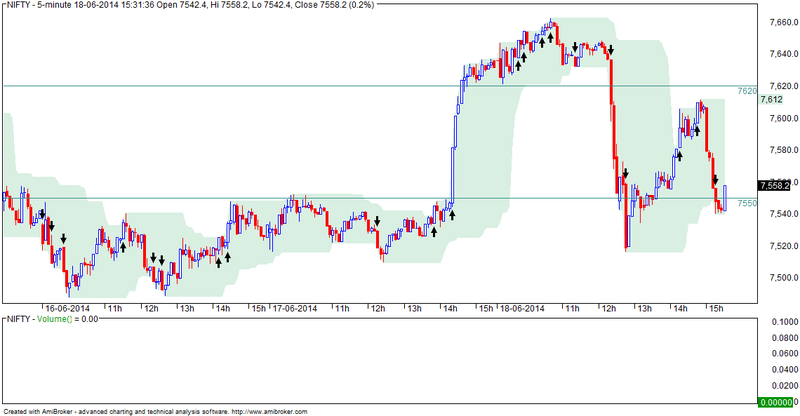 Note resistance at 7560-7600 levels. Option writing points to support at 7000 and resistance at 7500. Initial weakness failed to sustain and we got 2 buy signals - at 7410F and on close above 7430F (7455F). There was no short trade. Option writing points to a large trading range in JULY... current available levels are 7000 support and 8000 resistance. JUNE levels are 7000 support and 7500 resistance. Overall implication is limited upside this month while increasing chances of correction to 7100 levels. Thereafter strong rally leading to a new high in JULY. NIFTY... consider trend up as long as it trades above 7100. Note that option writing points to support at 7000 and resistance at 7500. There are 2 ways of using charts - softwares (Amibroker, Metastock etc) and web based charting applications (no software required). For most people, web based charting sites are more than adequate. These are mostly free and you get access to generally clean data, all the indicators and options for schemes, layouts etc. 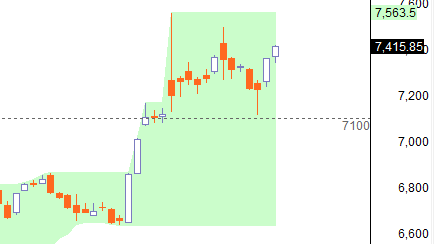 In addition, some of them even offer real time intraday charts (paid, icharts). Trend is up with support at 14500. Note large candlestick bar formed on 16 MAY (election results day). 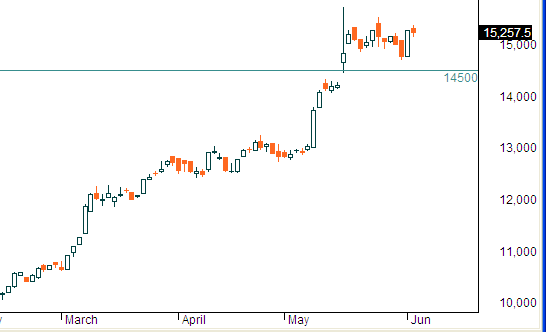 This denotes selling and it should be noted that the high formed on 16-MAY is not yet crossed. Trend is up with support at 7100. Note strong resistance at 7500 levels. Incidentally option writing points to support at 7000 and resistance at 7500. Elliot wave theory assume current rally is e leg and is likely to end soon. Breakout above 7400 F was a buy signal... however this failed and SL got hit. Trade was no profit no loss. Open interest points to resistance at 7400-7500. Support exists at 6800-7000. This means markets are expected to trade rangebound with limited upside this month. Let's see how markets trade this week in light of today's rally. 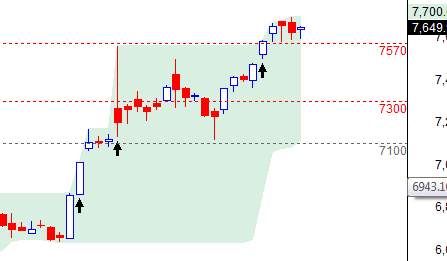 Breakout above 7280F was bullish... there was no sell throughout the day. 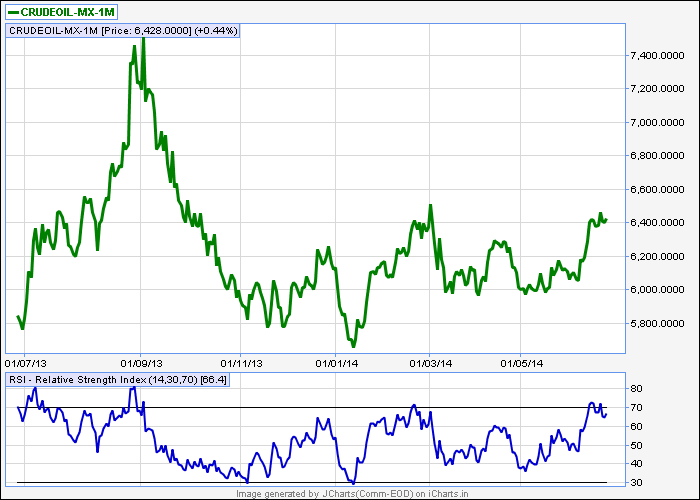 Markets maintain uptrend within the rangebound movement witnessed since May 16th. The trading range looks like a triangle which means after this rally (1-2 days), next leg will open down. 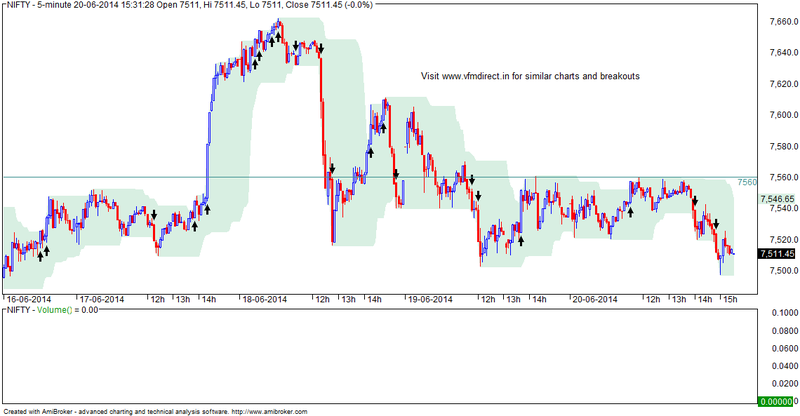 Put differently, consider trend as up as long as nifty trades above 7100. Current market movement since May 16th is proceeding like a triangle. The e wave has opened up today and is likely to remain smaller than the c wave (price wise). 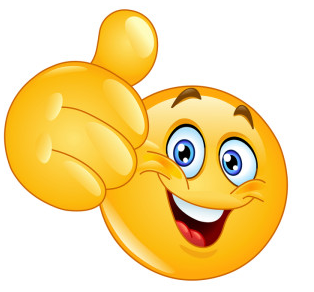 Very recently I came across this site chartink.com - a good site for EOD charts... for lack of anything to do on a rather lame weekend, I thought I will go thru their charts and post some views.